Hello everyone. Hope you week was awesome. 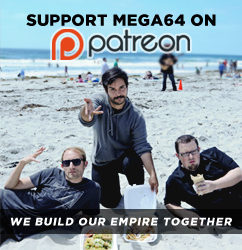 Let's get ready for another FLAWLESS chapter of the Mega64 podcast! In this episode: We talk about games we have 100%, 70's horror films and try to figure out our favorite game that we have never played. Plus, wrestlers from Super Awesome Showdown pay us a surprise visit and teach us some very important lessons. Check it out! Click here for the audio version! That's all for now, make sure you come back Friday to snag some sweet new merch!